Our vast selection of stock is available for immediate dispatch, from our central warehouse which offers the opportunity to view our carpets on the full broad loom width. A lways in stock is a large selection of end of contract weavings many at 50% discount - the majority are of wool content. We have a sample service available from our showroom branch. Shades range from the hot embers of red stone, the peachy tones of tango and the light gold of buttermilk, which offer good looks which will last for years to come. 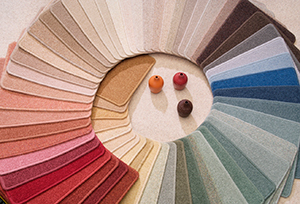 A wide selection of stain resistant polypropylene fibre carpet is carried in stock, which is resistant to dirt and spills, many offering a multi width service, wide colour choice, easy care carpet for most rooms in the home. Struggling to find the ideal colour:- let our bespoke contract division who offer traditional skills and expertise of our dyers solve the problem. Wordsley Carpets will match your fabric to any colour you desire accompanied with a unique any width service. An estimating and fitting service is available by our dedicated team of experienced personnel.